Travel brochure for the Bernina Railway, circa 1932. Published by the railway. printed by "Frobenius A.G., Basel. 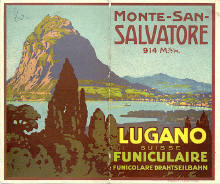 Travel brochure for Monte-San Salvatore, Lugano, 1931. Published by the Lugano Funiculaire. Ptinted by A. Trub & Co., Lugano. Travel brochure for the Astra Hotel chain, 1935. Published by the firm. Signed "W. N. Prachensky, Innsbruck." Printed by W.U.B., Innsbruck. Front cover. Travel brochure for the Astra Hotel chain, 1935. Published by the firm. Signed "W. N. Prachensky, Innsbruck." Printed by W.U.B., Innsbruck. Back cover. Travel brochure for the Hôtel Victoria, Geneve, Suisse, circa 1935. Published by the hotel, printed by Inst. Art. Brügger A.G., Meiringen. Shell map of Switzerland, circa 1930. 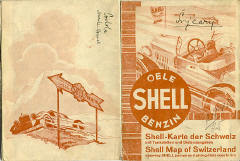 Published by Shell. Signed "Senn," printed by Art. Institut Orell Füssli, Zürich. "Die Schweiz: Taschenatlas für den Automobilisten," circa 1929 (Switzerland: Hand Atlas for Automobile Touring). Published by Kümmerly & Frey - Bern, for the Schweizerischen Verkehrszentrale, Zürich & Lausanne. Travel brochure for the Harder Bahn - Interlaken, Switzerland, circa 1931. Unsigned. Published by the railway.